The United States government every year conducts its well-watched American Community Survey (ACS), culling demographic, social and economic data from millions of addresses across the country. Its five-year file provides reliable statistics for small populations, and between 2008 and 2012 through representative interviews captured information about the country’s foreign-born (not a citizen at birth) population. Of the 39.8 million foreign-born people residing in the United States, about 4%, or 1.6 million, were from Africa. This is a 1,900% increase over 1970, when there were only 80,000 African-borns living in the US. The last 15 years have also been a sort of boom time: In 2000 the foreign-born population from Africa was 881,300, nearly half of the current population. 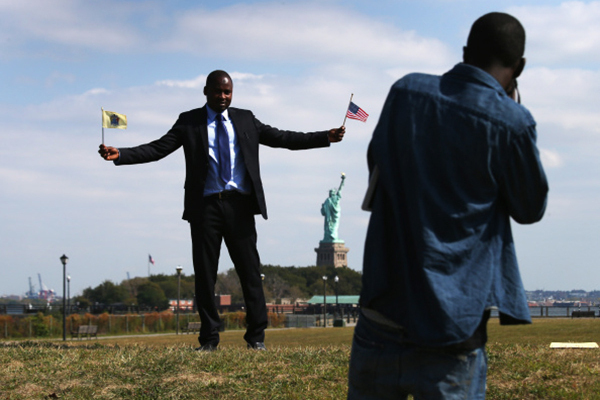 About 75% of this African-born population moved into the US after 1990. The survey notes that this was in part due to historical changes. African migrants started moving to the West in earnest after World War II, in search of jobs and educational opportunities. Their early destination was Western Europe, until that region tightened immigration rules after its economy begun to falter. A change in US immigration law in 1965, which prioritised skilled labour among other factors, then made it the more attractive destination for African migrants. Because of this, in part, the foreign-born population from Africa is more highly educated compared to the overall foreign born-population. Some 41% of the African-born population had a bachelor’s degree or higher, compared to 28% of the overall foreign-born population. Nearly a third (32%) of the overall foreign-born population had less than a high school education, compared with only 12% of the African-born population, and even less for South Africa (3%), Nigeria (4%) and Egypt and Kenya (both 5%). This difference in educational levels is in significant part due to how the populations immigrated to the United States over the survey period. Close to a quarter (24%) of immigrants from Africa entered on diversity visas, which require either a high school diploma, or equivalent work experience. This compares to just 5% of the overall foreign born population who entered via the same path. A notable exception is the foreign born population from Somalia, who entered mostly as refugees or asylum seekers. In 2010 these were 82% of Somalis, compared to only 1% on diversity visas in the same year. The survey notes that 40% of Somali-born immigrants had less than a high school education. Nearly a quarter of all immigrants from Africa to the US in 2010 entered as refugees or asylum seekers due to conflict; especially true of Somalia, Liberia and the unified Sudan. Of the 1.6 million born in Africa and living in the United States, there were regional variations. Western Africa had the biggest population at 36%, eastern Africa counted 29% and Northern Africa had a 17% share. Southern Africa and Middle Africa (both 5%) had the least, while those who specified “Other Africa” in the study were 7%. Nigeria has the highest African born population at 14% or 221,000, followed by Ethiopia (164,000), Egypt (143,000) and Ghana (121,000). Kenya, South Africa and Somalia round out the top seven origin nations. Most of Africa’s immigrants showed a preference for certain states, with New York the most popular. California, Texas, Maryland and New Jersey were the next most preferred states; combined they accounted for over one third—about 42%—of the foreign-born population from Africa. The continent’s sub-regions also show a preference for certain areas. West Africans are more likely to be found in Massachusetts, New York and Maryland. East Africans are concentrated in Minnesota, Virginia and California, while North Africans opted more for Florida, New Jersey and California. Southern Africans were more likely to go to Florida, California and Georgia. Some American states have Africa-born populations as the biggest percentage of the overall foreign born population. These are North Dakota and Minnesota (both 19%), and Maryland and District of Columbia at 15% each. On the flip side Africa- borns were surveyed at less than 2% in Arkansas, California, Florida, Hawaii and New Mexico. Some African countries have notably large populations in certain states. Egyptians number 31,000 in California, there were 15,000 Liberians in Rhode Island and Somalis were well represented in Minnesota, at 21,000. Texas was most popular with Kenyans while South Africans plumped for New York and New Jersey. Metropolitan areas with the largest African-born populations included New York (212,000), Washington, DC (161,000), Atlanta (68,000), Los Angeles (68,0000) and Minneapolis (64,000). Other high population areas on this list were Columbus, Baltimore and Providence. Cities in the western half of the country—especially the Midwest were not as represented. Some origin countries also showed up more in certain areas: Nigerians were found in large numbers in Dallas and Houston, Ethiopians in Washington, Ghanaians and Egyptians were significant in New York while Cape Verdeans were prominent in Boston and Providence. In keeping with the African tradition of sharing, no single country dominates the African-born population. But in line with recent developments, four: Nigeria, Ethiopia, Ghana, Egypt, Kenya and South Africa comprise over half of the count. Source — Mail & Guardian Africa. Where does Ugandan number stand? Why’s it that Kenya has that many immigrants? Just wondering!